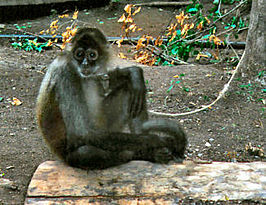 Spider monkeys are slim with long arms and legs. Their thumb is missing and they use their tail as a hand and to grab. They are very talented climbers and are living in the tree tops. They feed on fruit and leaves and are living in groups of 12-35 individuals. They are highly endangered from extinction.